we are engrossed in the arena of presenting to our patrons highly reliable Anodizing Job Work.Provided services are rendered underneath the assistance of nimble professionals who have enormous experience in this realm. More to this, these services could be purchased from us at enormously reasonable costs as per our patrons varying desires. Hard Anodizing gives thicker and harder layer on Aluminum than usual Anodising. The layer can be around 0.100mm thick. The abrasive wear resistance of Hard Anodized layer is better than that of hard chrome, Electroless nickel and Nitrided steel. Supported by a team of experienced professionals, we are able to offer a qualitative range of Bright White Anodizing Razor Part Services. Our professionals closely coordinate with the clients and design the entire services as per their requirement and preference. 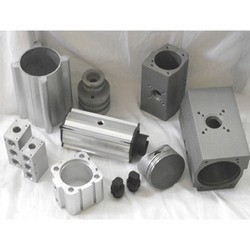 These services enhance the life span of metals and make them corrosion resistant and have anodic oxide finish. Strong resistance to corrosion abrasion and wear along with various colors and aesthetic designs are obtained through anodizing, a process that grows an oxide finish from the base metal. With the help of our experienced professionals, we are able to render Color Anodizing services. We offer a wide range of colors to chose from. - We provide test reports with each batch of material that we color anodize. MICRON ANODIZING;-What is Anodizing Anodizing is an electrochemical process that converts the metal surface into a decorative, durable, corrosion-resistant, anodic oxide finish. Aluminum is ideally suited to anodizing, although other nonferrous metals, such as magnesium and titanium, also can be anodized. We hold specialization in offering consultancy services for set up of Hard Anodizing Plant. 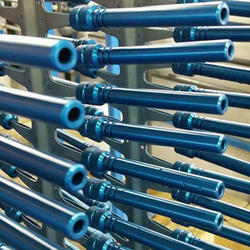 Our organization provides aid in installation and commissioning of hard anodizing plants at the clients' premises. Furthermore, we make use of advanced technologies and latest machines for proper execution of these services. Leveraging on our huge industry understanding and knowledge, we are providing Aluminium Anodizing Service.